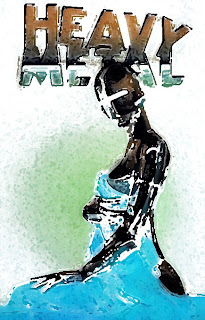 Gas Lantern Media | audio, video and words in review: Metal Tuesday: thoughts and considerations. Metal Tuesday: thoughts and considerations. Academically and compositionally speaking metal, is a heavy (pun intended) and advanced music. Bred from Rock, Blues and Punk, metal has an transcendent musical ability to capture the parts of any sub-genre, bringing metered ballads and high-speed finger-blisterers in equal quantity. Bands like Black Sabbath and Led Zeppelin composed canonical hits that will remain popular for decades, despite their initial critical pannings. And from those beginnings, bands like Motorhead, Iron Maiden and Dio took the burgeoning rock sect in entirely new directions emphasizing speed, volume, and growling vocals. These trends advanced through the '80s, '90s and '00s to popularity and then a decline as metal drifted from style to style; from prog-rock to something like emo and back to the rock/punk origins that made it famous. Why am I writing about metal today? Well, I've been exposed to metal more in the last couple of weeks through recommendations from friends and some of the music brought in for listening by my coworkers. Metal was never a passion of mine because I tended to side with more folk/classic/pop compositions and assume that there was something to fear (or popularly dislike) in metal. I've come to realize that metal, as with all things deserving admiration and respect, evokes a fear because it provokes emotion and challenges values, or at least "values" in some sort of Reagan-esque pseudo-sense. As abrasive musically as it can be, it is also some of the most technically advanced production music available. Really, the solos can be likened to the result of plugging in and distorting a classically trained guitarist. And some of the more complex drum beats are so incredibly intense that it seems they could rewire the listener's heart. And yet, metal remains a sort of fringe music that is alternately associated with Satanism, violence and adolescent anger. Certainly metal addresses all of these topics, but it doesn't promote them so much as voice them. In the same way that folk voices love, or glam-rock voices sexuality. Given the incredible musicianship required to play metal (especially the speed/punk varieties) we should respect it just as we might a symphony due to its brilliant composition and complexity. The only reason we do not is the unfavorable/culturally-less desirable emotions attached to it. For a "peace-loving, advanced person" revelations in anger, death, violence and adolescent fantasy seems inappropriate, regardless of how artistically they may develop. Metal is challenging in the same way modern art can be, and Rock 'n' Roll was when it first popped up in the '50s. Both modern art and Rock have entered the popular canon, and while taste may dictate liking it, both are recognized as artistically valuable. For metal, it seems like the field isn't even. People who love metal, LOVE metal, but there lacks a compromising middle-audience who gets how awesome it is, but doesn't love it. It's like metal is the Brussels sprouts of the music world: love it or hate it. The play list from the last couple of days has included: Pantera, Motorhead, Dio, Black Sabbath, Danzig, Tool, and Led Zeppelin (on my own time) among others. And I haven't heard a song I didn't genuinely enjoy, despite the screeching guitar, growling vocals and agitating drums. The dichotomy deserves challenging, metal should instead toggle a new way: love it or appreciate it. Notable Text: Eleven Kinds of Awesomeness. Putting the gore in Victorian.